We are extremely proud of what over 1,500 artists and buyers accomplished through our Help Japan Challenge in March of this year. In only one month, we raised almost $30,000. We are beginning a new challenge of the heart to help the hundreds of thousands of starving children in Africa due to a devastating drought. We are honored to be able to set this up and then step out of the way and watch with profound gratitude as so many pull out their paints, brushes, and wallets and give so wonderfully. Click here to go to and read about the challenge and view and bid on the entries. Please help us spread the word about this fundraiser far and wide. Post it on your Facebook page, your website, your blog, and email and tweet all your family, friends, and patrons. Many of you have received emails claiming your auction is ending soon, when in fact it isn't. Please forgive me for this issue. While deploying a new feature to let folks know that an auction is ending in 30 minutes, I made an error that disregarded the date in the calculation. Please know there is no issue at all with your auction - their ending dates have not changed. Only the email you received is in error. I have corrected the issue and you should not see these erroneous emails again. New Improvements - Faster and where are the Challenges? So, after more twiddling, I have sped up the loading of the search mode of the Featured, All, and The Day's Art pages. I have also added a new Notification bar at the very top of the site. In addition to it being the new home for the Facebook like button and, now, the new Twitter and Google +1 buttons, the notification bar will be used to deliver member and buyer targeted messages. Also, I have moved, once again, the link to the challenges. I have done this, not just to keep you all on your toes, but because I have received feedback that artists have sold work through the challenges. For this reason, I have moved the link back down to the buyer-focused main menu. I spent the day ripping, gutting, tearing, and generally delicately tweaking the code that generates the pages with the painting thumbnails, and was able to squeeze so much more performance out of them that I have bumped the per-page painting count from 60 up to 100. The Day's Art page, however still shows 150 per page. This will show more artists at a time before requiring buyers to go to the next page of paintings. Please let me know if you don't see a net increase in the speed of loading of the Featured, Art, and The Day's Art pages. I have increased the number of paintings I show on the first page of The Day's Art page from 60 to 150. This will help everyone have a better chance to be viewed. I will leave the other pages at 60 paintings per page for performance reasons. I have had feedback that buyers have gone to the Featured Art page looking for a general member, opened the search bar, clicked the Artist button, and could not find the artist. The reason for this is the Artist search button in the search bar near the top of each page only searches through the artists on that page. Well, I don't want to stand in the way of buyers finding you, so now, there is now an artist drop-down in the Quick Search sidebar that will find you no matter where you are. If the buyer is on the Featured Art page and they search for a general member, then they will be taken to the All Art page with the artwork for that artist. Please, keep the suggestions coming - many of my best ideas come from our members and buyers! Thank you to all who posted comments and sent me emails with suggestions and advice about PR and my idea of enlisting our members to help. I have newly realized two things: 1. Our members are too busy painting to worry about helping DPW with PR; and 2. I have a lot of experience developing websites, but not so much with PR. So, I have retained the PR services of MyMarketMessage.com. Jennifer Marine, the owner, is the same Jennifer that offers very effective online interactive classes on setting up your blog, a Facebook page, and whatever else you need to get started or improve your online marketing. Many of our members have taken her classes and have given her rave testimonials. I wholeheartedly recommend her classes. She even offers free newbie online videos and an cheap newbie class for those still learning the basics of computers and the internet. For those of you who have noted that Jennifer, Carol, and I all have the same last name, it is because Jennifer is my ex-wife and one of my and Carol's dearest friends. Lucky me that she can help me with PR! I'll continue to post here and keep you all up-to-date with our progress. 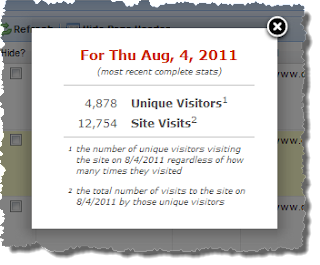 I have added a Site Stats link to the top menu of DPW, off on the right. 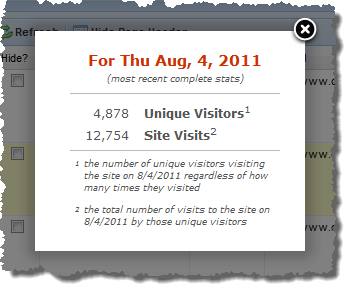 If you click on it, you will see the unique visitor and the total visits counts for the previous day, which is the latest day with complete stats. I have found Google Analytics and sites like Compete.com and Alexa.com to be wildly inaccurate, some way too high and others too low. So instead, I wrote code to log the access myself, which is absolutely precise. So now, along with being able to track your own stats in your my paintworks statistics page, you can also see how the site is doing overall.